Behind the French Menu: Vinegar, Vinaigrette and Verjus in French Cuisine. Drawing by Louis Figuier, (1819-1894). Photograph courtesy of Biblioteca de la FacuThe ltad de Derecho y Ciencias del Trabajo. The University of Seville, Spain. To make a good salad is to be a brilliant diplomatist---the problem is entirely the same in both cases. To know exactly how much oil one must put with one's vinegar. From the play Vera, or the Nihilists. This was the first play written by Oscar Wilde and was published in 1880. This quote is from © 1997–2010 Corpus of Electronic Texts (UCC). Oscar Wilde; author, poet and playwright was born in Dublin and died in Paris. 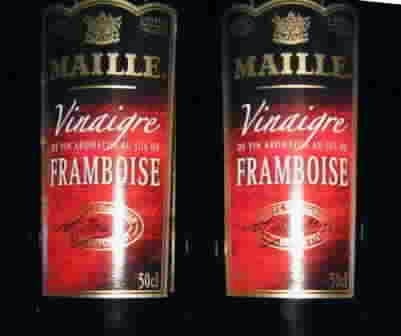 Vinaigre – Vinegar; the word comes from the French for sour wine, vin aigre. Despite vinegar’s origins in today’s French kitchens, plain wine vinegars have a great deal of competition. 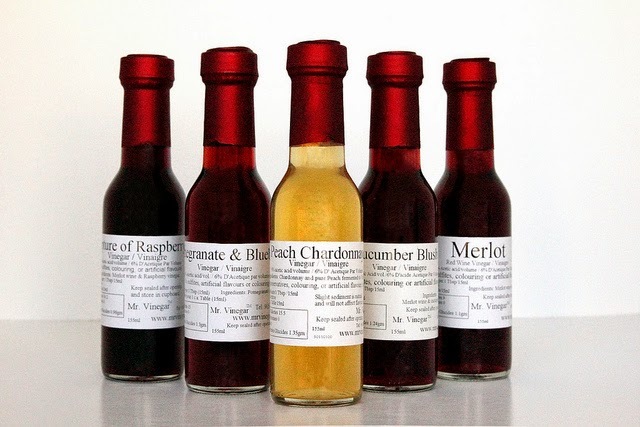 Flavored wine vinegar's and fruit vinegars are in every restaurant and home kitchen. Among the many fruit vinegars, Normandy and Brittany promote cider vinegars alongside their famous ciders and apple brandies. All over France distilleries producing alcoholic fruit eau-de vies will be out there selling their fruit vinegar as they are important by-products. The traditional sauce vinaigrette was made with wine vinegar. Nevertheless, fruit vinegars and of course that much enjoyed Italian import balsamic grape vinegar are often in contention. When wine vinegar is used then the name of the wine that was used to create the vinegar is usually on the menu. Cœur de Bœuf, Rôtie au Vinaigre Chardonnay, Salade et Truffe d'Été - The beefsteak tomato roasted and served with a salad with winter truffles flavored with chardonnay wine vinegar. Photograph courtesy of Renée Suen. Fines Tranches d’Agneau, Vinaigre de Merlot, Huile de Noisettes Courgettes et Tomates Confites, Racines d’Hiver. Thin slices of lamb served with merlot wine vinegar and hazelnut oil, accompanied by a thick and sweet courgette, the USA zucchini, and tomato jam and winter root vegetables. Tranches de Foie Gras aux Figues et Gelée au Vinaigre de Muscat de Rivesaltes – Slices of fattened duck liver served with its own jelly and a fig jam flavored with vinegar from the sweet Muscat de Riversaltes wine. Vinaigre Balsamique - Balsamic vinegar. Balsamic vinegar is only legally produced in and around the city of Modena, Italy. Despite balsamic vinegar’s Italian provenance, the French recognize and happily receive the best products from around the world and they incorporate them in their kitchen. Balsamic vinegar is very popular and its use will be noted on the menu. Aging barrels of Balsamic Vinegar. Photograph courtesy of Città Di Modena. 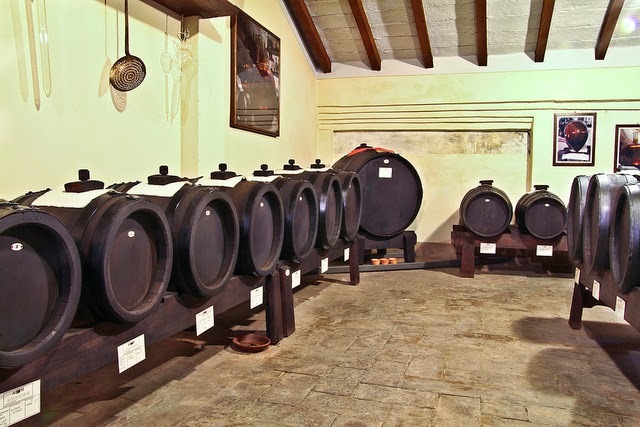 Balsamic vinegar comes from the Trebbiano grape. It owes its unique taste not only to that grape but also to the manner in which it is aged. The aging process takes the vinegar through to five different wooden barrels, each adding to the flavor. This grape vinegar is unlike most grape-based vinegars as it was never a wine. However; despite never having been a wine the vinegar itself does ferment. Then, as part of its aging, the cellar master, as with fine wines, must evaluate the exact amount of fermentation as the vinegar passes through the five barrels: oak, chestnut, cherry, ash and finally mulberry, before being bottled. A young balsamic vinegar will rarely be less than five years old. The finest balsamic vinegars are aged for 15 to 30 years and are more expensive than many fine wines. Foods and salads prepared with balsamic vinegar offer a different and unique taste. Salade de Chèvre Chaud, Échalotes Rôties au Vinaigre Balsamique- A hot goats’ cheese salad served with roasted shallots and Balsamic vinegar. Cailles Rôties et Pimientos au Chèvre Frais, Vinaigre Balsamique Réduit - Roasted quail and sweet peppers and fresh goat’s cheese served with a thickened balsamic vinegar sauce. Risotto aux Légumes, Vieux Vinaigre Balsamique, Roquette et Parmesan - A vegetable risotto flavored with an aged Balsamic vinegar, rocket and Parmesan cheese. Magret de Canard au Miel et Vinaigre Balsamique – Duck breast cooked with a honey and Balsamic Vinegar sauce. Soupe de Fraise au Vinaigre Balsamique - A cold strawberry soup flavored with Balsamic Vinegar. Balsamic sauce or Balsamic reduction. 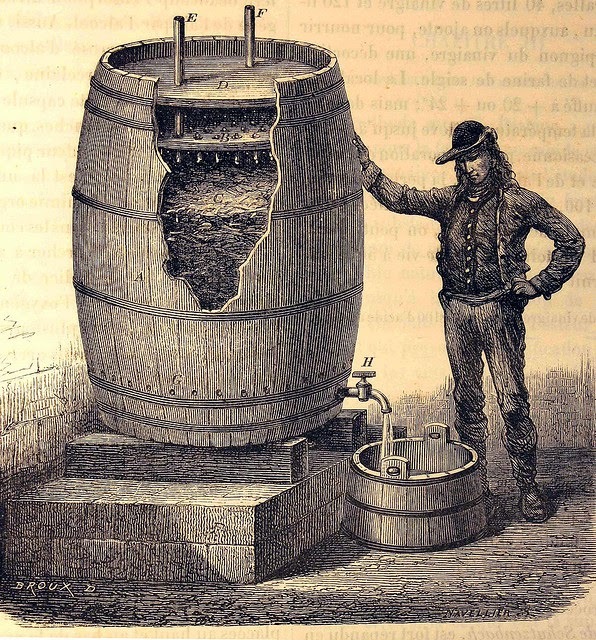 Vinaigre d'Orléans – The vinegar of Orleans. A wine vinegar from the town most associated with Joan of Arc. Orleans is on the Loire river in the valley of the Loire. This vinegar is aged for a minimum of six months before being sold. Salade de Mâche et Betteraves et Vinaigre d'Orléans "Vieille Réserve”. - A salad of France’s wonderful lambs’ lettuce salad greens, beetroots, and an especially old Orleans vinegar. Ravioles d'Épinards, Sauce au Vinaigre d'Orléans. Spinach ravioli served with an Orleans vinegar sauce. Vinaigre de Cidre – Cider vinegar. Most cider vinegars though fermented are made from apple juice before it has become cider. Despite that, there is a great deal of competition for the sale of cider vinegars and some will be aged in oak barrels. Chefs use cider vinegar in recipes where its unique taste makes a difference. Still, cider vinegar is a strong tasting vinegar and so it is used carefully. Colvert Rôti, Navets Confits au Vinaigre de Cidre – Mallard duck served with a sweet turnip jam flavored with cider vinegar. Pavé de Cabillaud Rôti au Vinaigre de Cidre, Pot au Feu de Légumes - A thick slice of roasted cod flavored with cider vinegar and served with a vegetable pot au feu, a heavy stew. Suprême de Pintadeau Braisé aux Pommes et Vinaigre de Cidre – Guinea hen breast braised with potatoes and flavored with cider vinegar. Vinaigre de Fraises - Strawberry vinegar. Strawberry vinegar may be either a flavored wine vinegar or a vinegar made from a strawberry eau-de-vie. Strawberry vinegar along with other sweet berry and fruit vinegars are mostly used to flavor sauces. The examples below show just three fruits, but practically every fruit that is made into an alcoholic eau de vie also has its own vinegar. Carpaccio de Lotte au Vinaigre de Fraises. – A monkfish Carpaccio marinated in strawberry vinegar. Rhubarbe et Vinaigre de Fraises- Rhubarb cooked with strawberry Vinegar. Magret de Canard au Miel d'Acacia et Vinaigre de Framboise – Duck breast cooked in accacia honey and raspberry vinegar. Salade de Gésiers d'Oie déglacée au Vinaigre de Framboise - A salad of goose gizzards cooked in a thickened raspberry vinegar. Viinaigre de Jerez - See Vinaigre de Xérès . Vinaigre de Pêches - Peach vinegar. Aiguillettes de Canard au Vinaigre de Pêches. – Slices of duck flavored with peach vinegar. Vinaigre de Pommes - Apple vinegar. See Vinaigre de Cidre. Vinaigre de Reims (Le) – Reims Vinegar; a vinegar made from Champagne; this is considered to have a lighter touch than other wine vinegars. Reims is the largest city in the Champagne-Ardenne region and that region that is home to most of the Champagne vineyards. Daurade Marinée, Pommes de Terre, Oignons Rouges au Vinaigre de Reims - Marinated gilthead sea bream, potatoes, red onions prepared with the Reims vinegar. 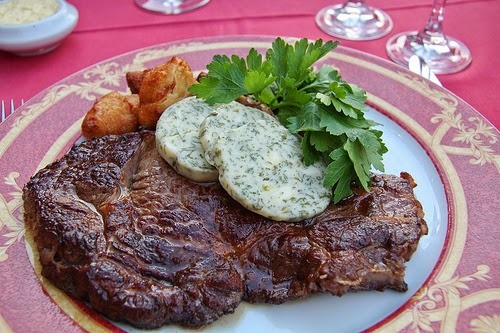 Entrecôte de Bœuf Échalottes au Vinaigre de Reims – An entrecote steak prepared with shallots and flavored with Reims vinegar. Reims is the most important town in the Champagne area and is made with Champagne. 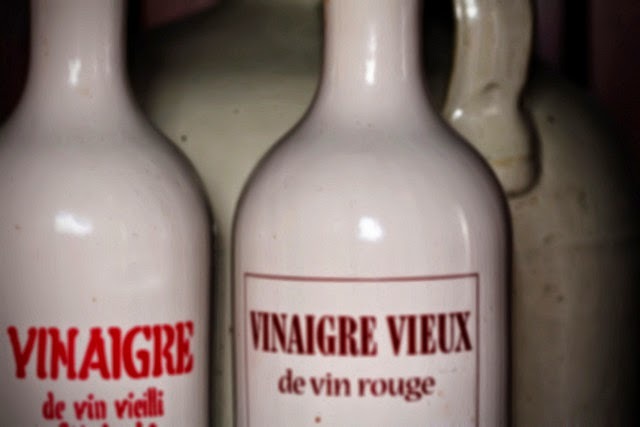 Vinaigre Vieux - Aged vinegar. While the words aged vinegar could refer to any vinegar when no further description is offered it is an aged wine vinegar that will be used. Farci de Tomate aux Fregola Sarde, Girolles et Vinaigre Vieux- Stuffed tomatoes with the unique Sardinian toasted wheat pasta prepared with chanterelle mushrooms and flavored with aged vinegar. Photograph courtesy of Sharon Mollerus. Vinaigre de Xérès - Sherry Vinegar. 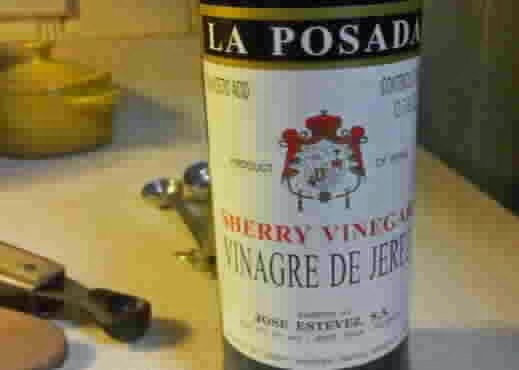 Despite its Spanish provenance, this is a very popular vinegar in French kitchens. Sherry vinegars are produced in the same area where sherry wines are produced in Spain. 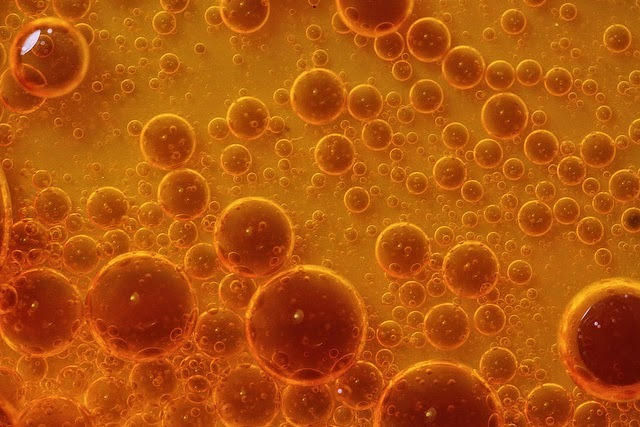 Sherry vinegar is aged in oak barrels for a minimum of six months and while in the barrel, like other wine vinegars, the presence of oxygen allows bacteria to convert the alcohol to vinegar. True vinegars have at least 6% acetic acid and sherry vinegars additionally have about 3% residual alcohol. The original taste of the sherry remains with the vinegar and allows it to produce some very special tastes. A sherry vinaigrette sauce with a salad can be wonderful. Photograph courtesy of Miss Anna Lynn Martino. Like the producers of balsamic vinegar, sherry vinegar producers have realized that there is a great deal of added value when they sell well aged and flavorsome vinegars. All sherry vinegars are aged in a barrel for at least 6 months and then may be sold as a Vinaigre de Jerez. Older sherry vinegars spend two years in a barrel, usually oak; these vinegars are called Gran Reserva and their price is much higher than the six-month-old vinegars. 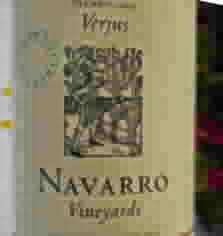 After ten years in the barrel, a very expensive vinegar will be produced; this is a unique vinegar called Vinagre de Jerez Gran Reserva. Ris de Veau, Risotto Arborio au Parmesan, Jus Aigre Doux au Vinaigre de Xéres. – Veal sweetbreads served with a risotto made with Arborio rice and Parmesan cheese and flavored with a sweet and sour sauce made with Sherry vinegar. La Salade Tiède de Scampis Grillés au Vinaigre de Xérès et Pointes d'Asperges – A warm salad of grilled scampi, Dublin bay prawns, served with Sherry vinegar and asparagus tips. Salade de Rillauds d'Anjou au Vinaigre de Xérès. A salad of spiced pork belly pieces, prepared in the manner of Anjou, cooked until crisp and crunchy. Pigeon Entier, Désossé, Sauce au Miel et Vinaigre de Xérès – A whole pigeon, deboned and prepared in a sauce made of honey and sherry vinegar. Vinaigrette - The most well known of all French sauces or salad dressings. The original and traditional French dressing is olive oil, vinegar, mustard, garlic and herbs. This is the dressing often just called a French dressing and that it is; it is also always better when tasted in France! Verjus - Juice from unripe grapes. Unripe grapes are not sweet and while verjus does not taste like vinegar it was used in the Middles Ages in much the same way as vinegar is used today. Then a few hundred years ago vinegar took over from verjus in the popularity polls. Now, knowledgeable chefs are looking at the different tastes that certain verjus’s create. They are using those tastes and putting them back on the menu and recreating flavors that were lost along with new creations. The name verjus is old French and simply means green juice. Huîtres en Papillote au Verjus – Oysters baked with verjus inside a sealed baking parchment paper or aluminum foil. When ready the sealed parchment or foil will be placed on the table and opened in front of the diners. Then the concentrated aroma may be appreciated before the dish is served. La Salade de Canard Fumé au Verjus – A salad made with smoked duck and served with verjus instead of a vinaigrette sauce. Poitrine de Colvert au Verjus – Breast of mallard duck prepared with verjus. 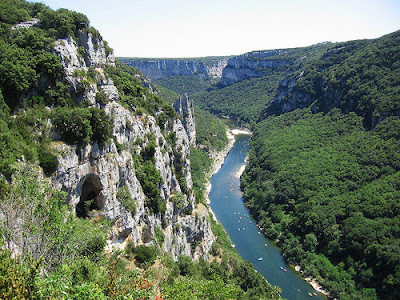 Anjou and Angevines – Dining in the Maine et Loire, France. Asparagus; green and white asparagus. The Town of Argenteuil and its Famous Asparagus and its even more famous painters. Caille– Quail; the Bird. Quail on French Menus. Carpaccio? The Original Carpaccio and How to Order a Carpaccio inFrance; France's Love for an Italian Dish. Champagne the most famous sparkling wine in the world. Choosing the Champagne that Meets your Sweetness Preference. Chanterelle Mushrooms, the Most Famous Four. Chanterelle Mushrooms on French Menus. The Mushrooms of France IV. Cidre - Cider in France. France's Fabulous Ciders, Sparkling Ciders and Basque Cider. Cod; the Fish. Cod; the Most Popular Fish in France. 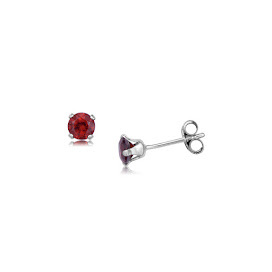 Dorade or Dorade Royale. Gilthead or Gilthead Sea Bream. Gilthead Seabream on French Menus. Figues - Figs. Figs on French Menus. The Best Figs in France are the Figues de Sollies. Foie Gras - Fattened Goose or Duck Liver. Foie Gras on French Menus. Foie Gras in French Cuisine. Magret de Canard or Lou Magret, Duck Breast Dishes and Recipes on French Menus. Miel- Honey. The Many, Varied and Wonderful Honeys of France. Monkfish – Lotte or Baudroie. Searching for the Most Popular Fish in French Restaurants; Monkfish is Number Two in the Top Ten. Muscat de Beaume de Venise Wine. A Unique and Special Wine Found in Every French Chef’s Wine Cupboard. Ordering a Perfect Entrecote Steak in France. Mâche – Lamb's Lettuce or Corn Salad. Lamb's Lettuce in French Cuisine. Ris de Veau (d'Agneau) - Sweetbreads on French Menus. When sweetbreads are on the menu in France do not pass them by. Shrimps and Prawns among the Crustaceans on Your French Menu. The Magnificent Ciders of France, including France's Sparkling Ciders. All the French you Need to Know. Turnips, (Navets) Parsnips (Panais) and Swedes (Chou-Navets or Rutabaga). Traditional Root Vegetables in Modern French Cuisine. What is a Confit on a French Menu? Behind the French Menu’s links include hundreds of words, names, and phrases that are seen on French menus. There are over 400 articles that include over 2,500 French dishes with English translations and explanations. Just add the word, words or phrase that you are searching for to the words "Behind the French Menu" and search with Google.